When preparing to publish my book on structured prayer journaling, I told my editor, Lil, that I thought we should call it, “The Gripper!” to my husband’s dismay. He did not like that idea and neither did she…lol. But seriously, it is the place where I go to get a grip, and it is small enough to grip in my hand. It was a no-brainer! 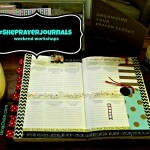 I think it is the perfect name for this type of prayer journaling organizer, but, I guess I am alone in that thought. What about you? Do you like the name, “The Gripper”??? Later on, my marketing manager, Julie, recommended that I create a Pinterest board of prayer closets. After all, that is the title I have given my structured prayer journal – the Prayer Closet Organizer, which is housed inside my book. 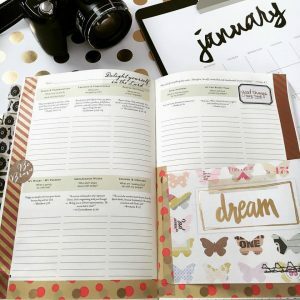 But, after I explained to Julie how I use my structured prayer journal, she completely understood why I do not specialize in creating prayer closets. 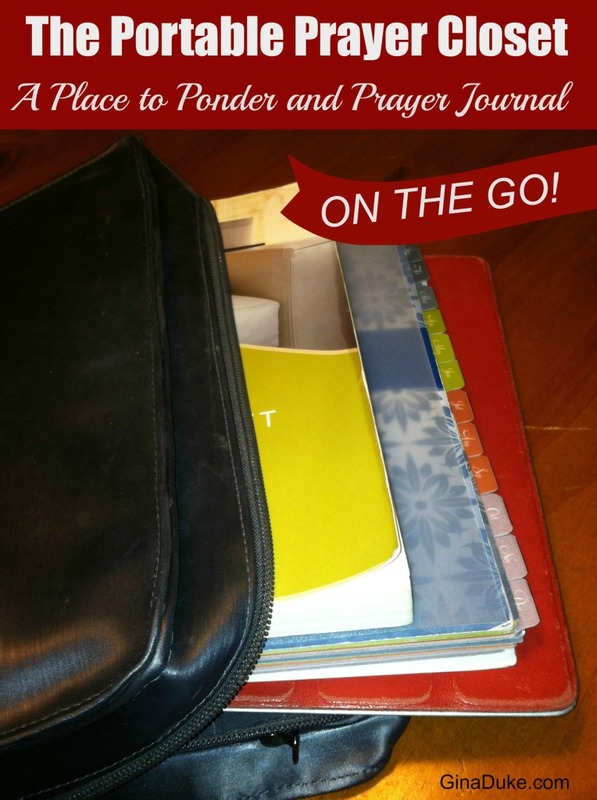 My Prayer Closet Organizer can go everywhere I go. When I used to use a printed Excel spreadsheet, I could fold up that week’s worksheet and keep it inside my Bible during my travels. 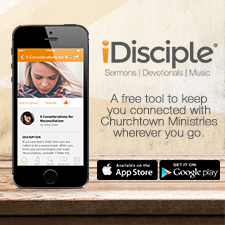 Now, my structured prayer journal, which is the same size as my Franklin Planner, fits perfectly in my binder along with my iPad, and this is what I carry everywhere I go. 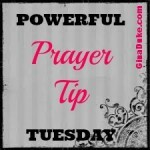 So, when God speaks to me, I pull out my structured prayer jouranl, flip to my week’s worksheet and make my entry. I’ve been at my girl’s gymnastics practices, and been in my prayer closet. I’ve been in a doctor’s office waiting room, in my prayer closet. I’ve sat in traffic jams, in my prayer closet. 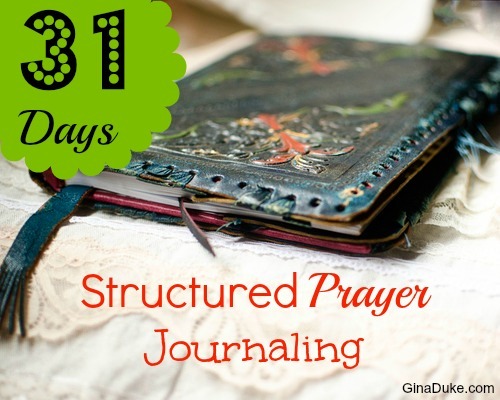 My structured prayer journal IS my prayer closet! I can go there anytime, anywhere! This is one of the things I love about it. I am able to get a grip, so to speak, when I need to! Although, I use it throughout the day, I do like to bring it out in the evening, typically after everyone else has gone to bed. I like to assess my day and make some final notes. I also enjoy making reviews of past entries and noting updates accordingly. After further organizing my prayer closet, I have a time of formal prayer. I do have a couple of places in my home that are comfortable spaces for that, like just sitting up in my bed beside my husband while he sleeps, or on my couch and in my recliner. I like a nice quiet time to relax and ponder. If you wish to create a comfy space in your home for pondering and prayer journaling, how about these ideas from my “comfy spaces” Pinterest board??? 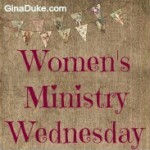 Follow Gina Duke / Churchtown Ministries’s board Comfy Spaces on Pinterest.Tomorrow I am going to tell you about the MAIN BENEFIT of structured prayer journaling! I am participating in The Nester’s 31 Days of Writing; you can go here to keep up with my 31 day feature on structured prayer journaling.